Oct. 23 – Everything torn down and packed ready for our move up towards Campobasso tomorrow. The Col. and Bob Scholes are up forward now looking for a place to set up. Oct. 24 – Moved off in convoy at 7 a.m. – passed through Lucera, Motta, Volturara, Gambeteza, and went into harbour about two miles east of Jelsi (Ielsi) which is about 18 miles from Campobasso. We are in open harbour, all under canvas – have our A.D.S. 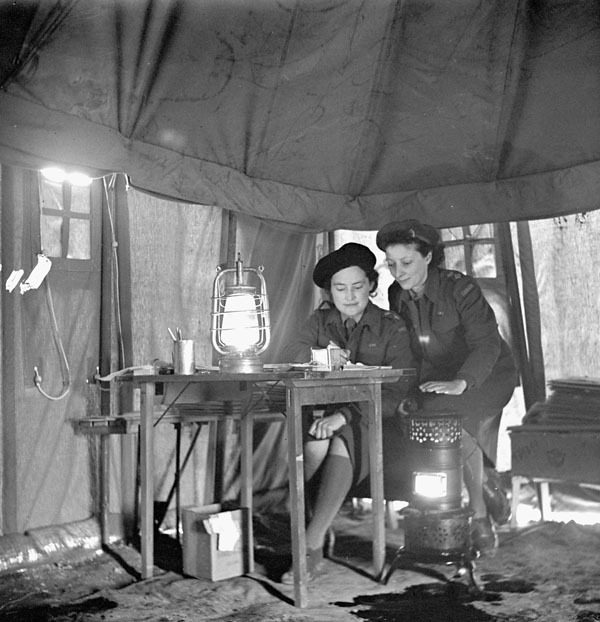 (Advanced Dressing Station) set up near the road – a mighty good set up too with M.D.S. (Main Dressing Station) on flat spot above us. I am living in my Italian tent which is fastened to the A.D.S. Ralph is sleeping here with me. Met a chap from Saskatoon today, a Lieut. Swanston with Hygiene Co. Had to go up with him Jelsi and examine a child, whom I diagnosed as Typhoid Fever – we will wait and see what the authorities say about it tomorrow – E.B. and I are planning to go to Motta tomorrow. Oct. 25 – Four months ago tonight we sailed on a LST in Convoy for Sicily. It seems much longer. It is very cold here tonight – the old desert tent seems rather bare. Rearranged my A.D.S. today and now have a real setup under canvas. “D” Section ins returning from the 14th today. The Brig. today said that we would be moving forward with the English troops in a few days. Will be glad to get going and really doing something but this soon. Have heard nothing more definite on the move to England yet, but if we do go it won’t be for a while yet. We now have been in Italy for the same length of time we were in Sicily (52 days). On Oct. 24 we moved off at 7 a.m. in convoy for a forward position, passed through Lucera, Motta, Volturara, Gameteza, and go into harbour about two miles east of Jelsi on a side hill. “B” Section sets up a M.I. room on the road side under canvas – the MDS (Main Dressing Station) also under canvas is on the hill behind us and behind the M.D.S. is the main Unit. Our purpose here is to serve Brigade troops – all Canadians are at this time out of the line on rest and the work is purely medical. We are about 18 miles east of Campobassao and can faintly see it in the distance, perched on a hill. It is very cold here especially at night, each morning snow can be seen in the mountains, but with our pup tents, Italian tents and desert tents, we are fairly comfortable and food is very plentiful – turkeys and pigs are everywhere and we are living better than we have for many months. Oct. 21 – Yesterday E.B. flew back from Catania as he relieved me today and Slim, Sgt. Hodgkins and I started up in our jeep to the XIVth. On the way up – Sgt. Hodgkins, my section Sgt. and a painter from Toronto, or rather an artist – sketched Bruce Trotter and Curly Lynch’s graves – then in Motta, or rather the approach to Motta he sketched out jeep with Slim and I on the winding road, with Motta sitting on its high hill in the background. We then went to on to Volutrara and he sketched St. Marcos (San Marco) in the distance, this is the battlefield over which we fought early in October, when we had so many casualties. Today it is quiet. We then went on about twenty five miles to a side hill from which we could faintly see Campobasso. They are very downhearted today as the General was not very complimentary to them yesterday.
. (assistant director of medical services). Had a turkey dinner and were entertained by the Sergeants in their Mess this evening. The new Col. has arrived. Col. Clendenning from Hamilton. Sick parade, Lucera. “B” Section. No. 2 C.L.F.A. October 1943. Sketch by Arnold Hodgkins. Doc Alexander with a member of “B” Section, Calgary Tank regiment. 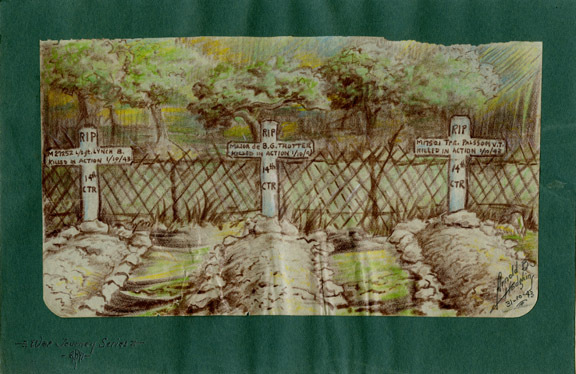 A sketch by artist Arnold Hodgkins of the graves of Sgt. B. Lynch, Major Bruce Trotter and Trp. V.T. Pallson, all killed on Sept. 31, 1943. Arnold Hodgkins served in the Royal Canadian Army Medical Corps, and it appears, he served with Doc Alexander and gave this sketch and a few others to him. This particular sketch is now in the collection of the Kings Own Calgary Regiment Museum at the Military Museums in Calgary. Oct. 17 Still in the same place – nothing new, but rumours are still very thick, either that we are going back to England or that we are moving forward. Have heard no more about my trip to England, so I guess that is off. Oct. 18 – Col. Hunter received word today of his promotion to A.D.M.S. – 1st. Echelon. We staged an impromptu party in celebration. Not bad. Oct. 19 – Have painted and resorted all supplies in section. Expect to move up in the vicinity of Campobasso by the last of the week. E.B. Queche has flown to Catania today, so I have been kept very busy. Russel Nobel flew to England today – Lt. Col. Received 21 letters tonight – ranging from June 14 to Oct. 5. I have no further news of my possible move to England – don’t know whether there is still a possibility or not. Am really not awfully interested one way or another. 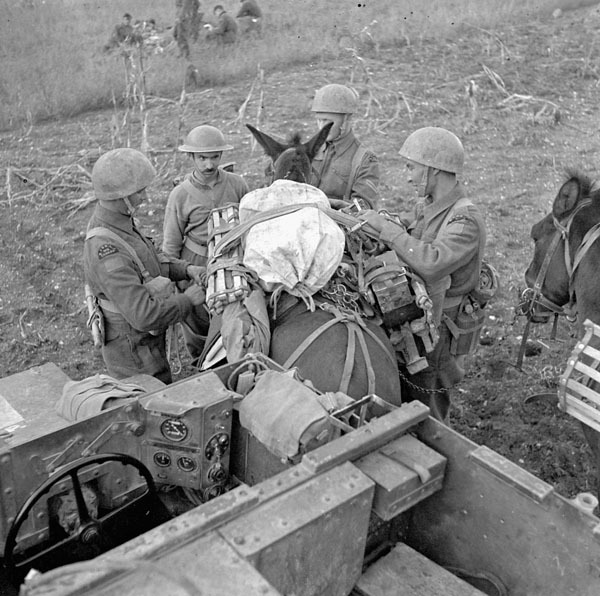 Unidentified Canadian soldiers with their Universal Carrier and a mule carrying supplies, Italy, 9-18 October 1943. Oct. 15-19, 1943: extended account of the Italian campaign. On Oct. 15 when Italy declared war on Germany, the reaction is funny, everybody laughs and pays no attention to it at all. On Oct. 18/43 Col. Hunter receives word of his promotion to full Col. ADMS – 1st Echelon. We hold a little impromptu meeting in the evening, but rather mild. 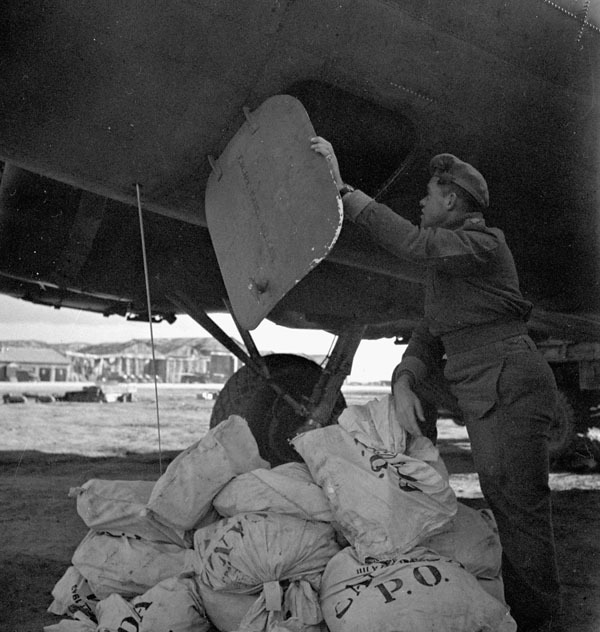 On Oct. 19/43 – E.B. Queche flew to Catania to visit his wife who is a nurse in No. 5 Canadian General. Only takes a couple of hours to make the flight. I am making arrangement to have Ralph transferred into the Legion. It will be a warm comfortable place for him when I am gone. I am very anxious that it goes through. Still running outdoor clinic and admitting; still as busy as ever. Picture show last night. Real fall weather. The whole Brigade is congregating in this area and reports are very strong that we will be leaving for England Nov. 15. Italy declared war on Germany yesterday. our reaction was a general laugh. We are still located on the Plains of Foggia. Oct. 11 – Have had a few very busy days – we have reorganized the whole section, rearranged all our supplies and are now completely set up as an M.R. room and admitting office Am also giving a course of lectures at 11 a.m. each day. there is a lot of work to do. A lot of Malaria and a lot of Infective Jaundice – also thousands of desert sores.. The Btn are all coming back from the line and are rallying in this vicinity. What the next move is I do not know. Have heard nothing more of the trip to England. We are living in desert tents pitched on the veranda of a big chateau. Oct. 3/43 – We go forward beyond Motta and stop and search the burned tanks. The bodies are all burned beyond recognition, but I find eight and am able to recognize them by their positions in the tanks – we send word back to the padre, the numbers and location of the dead, and continue our advance to the cross roads one and one half miles west of Motta. Here our tank column divides – two troops advance on Volturara and one troop swings to the right to cover Marcos – a little town to the right of Volutrara, and not on the main road. There is a concentration of Germans here who are giving us a lot of trouble. 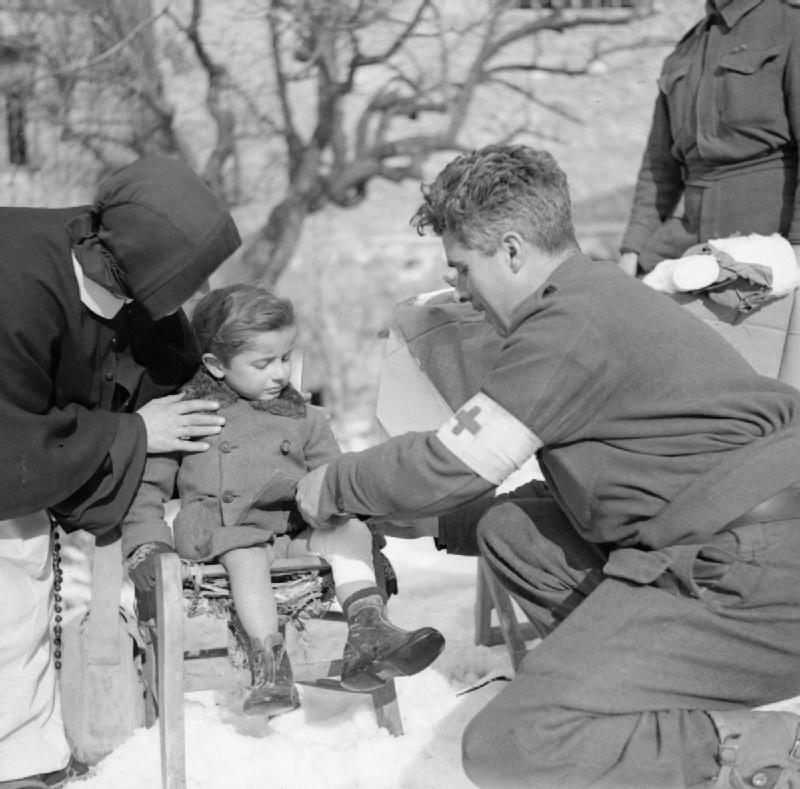 We send back and bring up our ambulance and station it in the vicinity of the cemetery, while we in the jeep accompany the Tanks towards Volturara, and Italian civilians are busy repairing it. The Infantry cannot get beyond the Town due to heavy fire from St. Marcos, and we cannot get through to the hills beyond Volturara to shell the Town. Capt. McIndoo and I go on a recce but discover nothing, so more artillery is brought up to shell the Town. It is decided not advance until the following day, so we bed down where we are. Slim, Ralph and I find a little deserted farm house below the hill and move in – we have a roaring fire and spend a very comfortable night, but have great difficulty in getting our jeep back on the road in the morning, as it has been raining all night, and everything is an awful mess. Oct. 4/43 – “C” Squadron will advance to Volturara at 9 a.m. – we will accompany them with jeep ambulance and one light ambulance. The tanks go cross country, straight down the hill towards the Town – we stick to the pavement and wind round and round the hair pin bends. There is a hold up ahead – the tanks are stopped on the side hill exposed to St. Marcos – we are with them. There is considerable mortar and anti-personnel fire, but eventually the tanks start on again and enter the Town. We enter the Town also and set up in the doorway of a blacksmith shop. A certain amount of anti-personnel fire, high bursting shrapnel continues during the day. The Tanks are held up in Town and cannot advance.St. Marcos must be taken and a combined Infantry and Artillery attack takes place and the Town is taken. We stand on the Main Street of Volutrara and watch the capture of St. Marcos. Brig. Wymann comes into Town and rules that I am too far forward so orders me to return. We move out of Town one mile and camp in a house facing St. Marcos. Tomorrow we have to go back and let another man come in. One more knock, I seem to be always getting them. Oct. 5/43 – We go out the branch road to the right in an effort to get Jack Jenner’s body, and cannot reach it due to enemy fire, so we return to Reception Post and Bruce Hunter, Jim, Bert go forward. We are relieved the following morning by Sedenburg, when we return to the 2nd Field Amb. 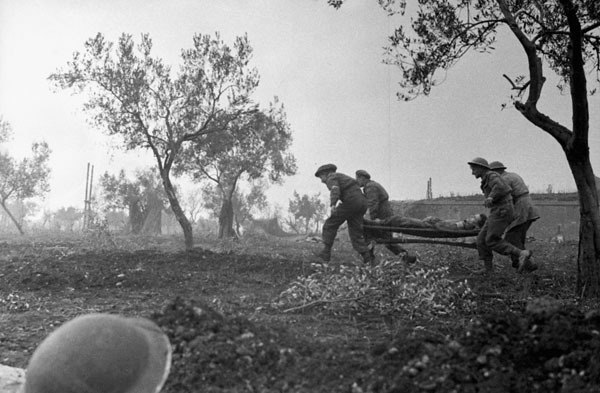 Oct. 6/43 – Sedenburg and “D” section came forward to relieve me, and I with my section return to the 2nd Field Ambulance, which is situated on the main Foggia road about two miles east of Lucera. In the evening I am called by Col. Hunter who at last agrees that we are at a dead end in the Tank Brigade and that as far as he can see, there is very little likelihood of us ever getting anywhere. He then informs me that my name has been submitted for the exchange. I will return to England to lecture the Amroured Medical Corps – and one of their officers will replace me here. I don’t know what to think of it, but he also said that on account of my age I was being withdrawn from the Field anyway, so I don’t know whether I’m pleased or not. My Sgt. has gone to Altu (?) and the Cpl. has gone to “A” as Sgt. I now have Sgt. Hodgkins and Cpl. Naylor. My section and I set up an admitting office and M.I. 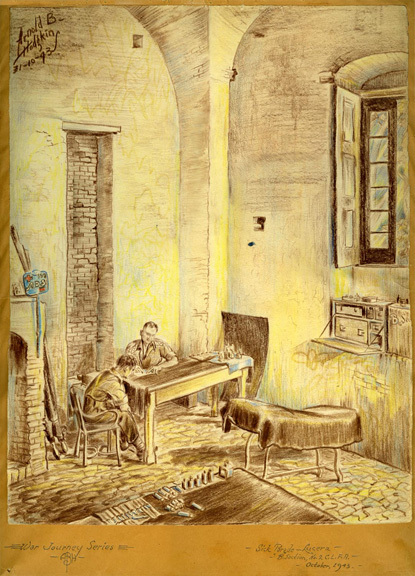 room – looking after Brigade troops, Canadians and English. It keeps us busy – the Hospital is right over us and is kept busy with Malaria, Jaundice and all the other usual things. We have rearranged all our medical supplies and I have given a course of lectures to my section, so they have been kept on the move. We are in a big chateau belonging to the Mayor of Lucera – very lovely place with no means of heating and no sanitary facilities at all. Our sick inspection room is large with stone floor and walls. We have it fixed up very well indeed, practially all with scournged materials. Malaria and Infective Jaundice are fairly heavy, and there are desert sores by the thousands. The main tank activity is about over – and the hills are wet and cold. We are in the centre of Foggia Plains. There is a constant roar of planes coming and going. The hospital is so full that the officers are living in tents pitched on the balcony. There is the odd picture how, the mail service is rather slow and many of the boys are getting badly browned off, as the MWS has never handled battle casaulties, but only sick.